Are you constantly looking for a job that’ll keep you fit, healthy and on your feet? Do you love making people’s day, and consider yourself the life of the party? Yes? We want you! Apply for a Job with Delta Force and you’ll create memories that will last a lifetime! Delta Force Paintball employees come from across the globe, and we will give endless opportunities to staff that have the initiative and drive we love. Below you’ll read the story of one of our employees, who has seen just a taste of what Delta Force Paintball has to offer. “I left my home in Albury a few years ago. I went to join a mate in Campbelltown, NSW who was living and working there. Through a friend of his I heard about a job working at Delta Force Paintball. I’ve worked for Delta Force for about 2 years now and I love it! At first I figured it would do as a starting point until I found something that would suit me better. But as it turned out, this job suits me perfectly. It’s never, ever boring. As a marshall for the game days I get to help players enjoy their day, and spend a lot of my time in the midst of the action. The atmosphere at the paintball centre is electric and the benefits of working for a global company are amazing! I’ve been sent to 3 different locations around Australia now! Once to fill in for another senior marshall after I got promoted, and I also transferred to Melbourne to work at the centre they have there too. As time goes on I’m hoping to work at all the centres Delta Force Paintball has around the country and enjoy all it has to offer. I’ve been told I’ve been singled out as one to watch who may suit other positions within the company. To do my time here in the trenches which I currently love, but may have the opportunity to move into an administrative role here in Australia or even overseas is just an awesome prospect for me. I seriously believe Delta Force is a fun and professional company with an amazing working environment throughout its structure. 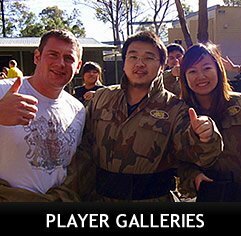 Working for the world leader in paintball has been a great experience. I’m looking forward to our expansion throughout Australia and elsewhere as well.